It is unknown when St. Aidan was born, but he was an Irishman, possible born in Connacht. He was a Monk on the island of Iona in Scotland. He was a Monastic Founder, and a Bishop. He also was a miracle worker, known for his kindness to animals. Tradition teaches us that his birth was heralded by great signs, and he showed evidence of piety as a small child. He was educated at Leinster, and Aidan went to the St. David Monastery in Wales. He remained there for several years, studying Scriptures, and his presence there saved St. David Monastery from Disaster. The Saxon war parties attacked the monastery during Aidan’s stay, and he supposedly repelled them miraculously. Over time, St. Aidan returned to Ireland, founding a monastery in Ferns. He also was appointed Bishop of that region. His miracles over the ages brought many to the Church. He lived in the time that the Roman Empire was spreading Christianity into Britain, but due to the Anglo-Saxon invasion of Britain, Anglo-Saxon paganism was now the dominant religion. Oswald of Northumbria and his brothers lived among the Gaels as princes that have been exiled. Oswald visited the monastery of Iona, and converted to Christianity. In 634 he regained the kingship of Northumbria, and was responsible in bringing Christianity to the people there, thanks to St. Aidan. St. Aidan was an inspired missionary, that would walk from one village to another, politely conversing with the people that he saw, and slowly interesting them in Christianity. Legend has it that the King gave Aidan a horse so he wouldn’t have to walk, but Aidan instead, gave it to a beggar. His style was to patiently talk to the people on their own level, and it was in this way that he and his monks slowly brought Christianity to the Northumbrian communities. In 651 a pagan army, led by Penda, attacked Bamburgh and attempted to set its walls ablaze. According to legend, Aidan prayed for the city, after which the winds turned and blew the smoke and fire toward the enemy, repulsing them; resulting in his patronage for fire fighters. Aidan became ill and died shortly after. 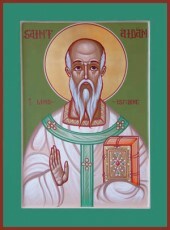 St. Aidan spent his life in service to the Church, as so many other great saints. He lived in a time where Christianity was not the popular religion, rather paganism. That didn’t stop him in his efforts to spread the truth, by walking from town to town, not only as a missionary, but also as the Bishop of that area. He was noted for his patient and steady preaching that would win the hearts of many to convert to Christianity. So deep was his faith, that he was blessed to perform many miracles.